Second-from-bottom Raiders matched their third-placed opponents for long periods, before the visitors finished strongly to win 51-21. Having trailed 20-10 at one stage, Worthing made a blistering start to the second half and had turned things around to lead 21-20 less than ten minutes after the restart. Old Elthamians’ quality and experience shone through late on though, as they ran in 31 unanswered points in the final 20 minutes. With fourth-from-bottom Barnes the only other team in the bottom six in action, Raiders knew a win could see them move out of the relegation places. 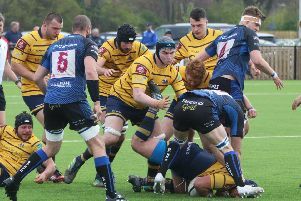 As it was, Worthing’s loss – coupled with Barnes picking up a losing bonus-point in a 18-16 defeat at Henley Hawks – leaves them four points from safety with seven games to go. Despite the defeat, Levett believes a replication of the opening hour in future matches will stand his team in good stead. He said: “It seems strange after a defeat but our huddle at the end was probably the most positive we have been all season. “The guys have challenged themselves against one of the best teams and have come off second best, but for large proportions there were some real positives. Raiders were reduced to 14 men 15 minutes after half-time when full-back Harry Forrest was yellow-carded. It was a moment Levett felt was critical in the eventual defeat and he said: “We probably needed two tries in the first half, for the one early in the second to be the third try of the day and then we would have had an even better chance. “It was always going to be a tough ask with the wind as well, ideally we’d have liked to have played the other way but we lost the toss. “We made silly errors, didn’t get the ball off the park when we needed too, which allowed them to counter attack, then we put ourselves under pressure going down to 14. Raiders welcome fourth-placed Taunton Titans to Roundstone Lane on Saturday for a third consecutive home game. The match gets under way at 3pm.